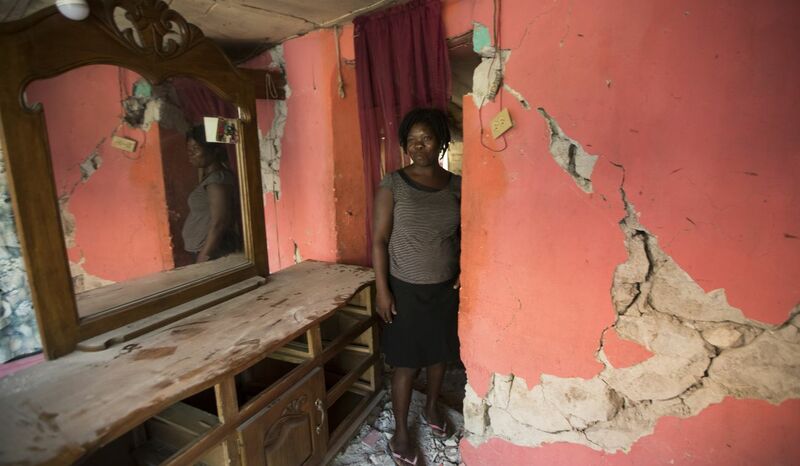 PORT-AU-PRINCE, Haiti (CNS) — As Haitian authorities confirmed the toll from the Oct. 6 earthquake at 17 dead and 333 injured, Caritas and other grass-roots organizations working with the victims highlighted the critical humanitarian situation facing survivors, who now lack shelter. More than 7,700 families are now in need of urgent humanitarian assistance; their houses having been destroyed or seriously damaged. And in an Oct. 8 situation report, the Catholic charitable agency Caritas Haiti said health, housing and education had also been hard hit by magnitude 5.9 earthquake. The Haitian Ministry of the Interior reported the destruction of or severe damage to at least 46 institutional buildings, including St. Michael the Archangel Catholic Church in Plaisance, and four schools in Pilate, east of the epicenter. Rosnel Jean-Baptiste of the Tet Kole peasant organization — with members throughout the northwest of the country, where the earthquake struck — said four members of the organization were killed by collapsing buildings in Port-de-Paix, 13 miles from the epicenter. Jean-Baptiste added that the earthquake has caused a mass exodus from Port-de-Paix, where several buildings, including the police station, were severely damaged. Caritas workers said the memory of the 2010 earthquake — which caused the death of more than 220,000 — is still a recent one, and the new quake with three aftershocks has sown terror among the people. Jean-Baptiste said those fleeing the city are scrambling to take tap taps, the Haitian public transport vehicles, on some of the worst-furrowed mud track roads in the country, to stay with relatives and acquaintances in the more rural areas. In these areas, many of the flimsy, roughly built houses with corrugated iron roofs collapsed on families but were not heavy enough to kill their inhabitants. In Gros Morne, south of the epicenter, the Institute of Technology and Animation, ITECA, a nongovernmental organization that works with peasant organizations, reported a very difficult situation facing survivors. Chenet Jean-Baptiste, ITECA director, reported that in one section of Ravine Gros Morne, where ITECA has a team, many people are sleeping outside. Caritas is responding to the situation by distributing emergency food supplies, sanitation kits, tents and shelter materials as well as solar lamps, shovels and wheelbarrows.